Still haven’t cracked the code on growth hacking? Don’t worry, it’s probably every bit as mysterious to you as the next startup – so don’t get discouraged. While the term has been around for several years now (since 2010 to be exact), the concept has not yet fully been grasped by everyone. Put simply, growth hacking is the ‘art’ of carrying out rapid experiments across marketing channels and product development with one constant goal – growth. Those capable of achieving this growth using both low-cost solutions and more unconventional marketing methods are referred to as ‘growth hackers’. Want to learn more? Stay tuned for our ‘must-read’ growth hacking guides below. Whether you’re a brand new startup or you’re simply looking to boost your business, we’ve got a great set of resources that will help you move forward. In this blog, we will take a look at some of the most valuable and informative growth hacking guides out there. These materials touch on different elements ranging from the core fundamentals of growth hacking to various strategies and techniques used by successful startups in the recent past. Neil Patel is a famous author, entrepreneur, marketer and blogger who helps companies generate more revenue through digital marketing. 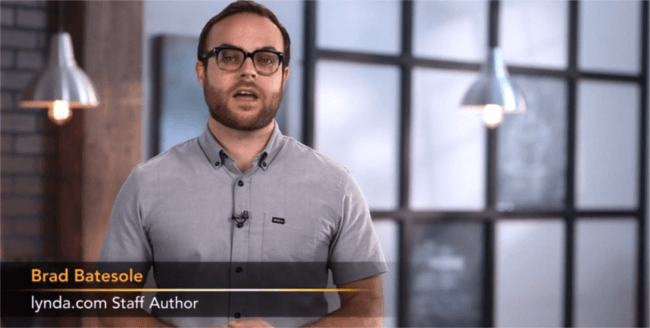 Patel together with Bronson Taylor (entrepreneur, startup advisor, author and co-founder of Growth Hacker TV) wrote this eBook on Growth Hacking, which has been downloaded over 440,000 times. Catered towards ‘entrepreneurs, founders, growth leads and anyone else trying to grow a startup’, this guide identifies a list of possible growth strategies packed into 10 chapters and 30,000 words. This is probably considered one of the most trusted resources among marketers for growth hacking. In other words, a great read to start with! Click here to view this growth hacking guide. 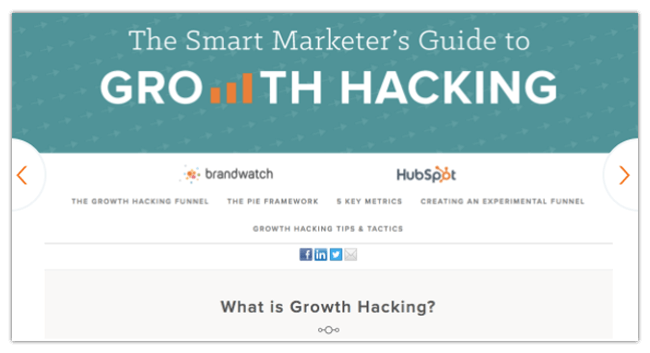 Smart Marketer’s Guide to Growth Hacking is a (free) downloadable guide available on HubSpot, a well-known inbound marketing platform. It starts out by pushing you define what growth means for you and your business (this can vary widely across the charts). This guide also hones in on five metrics growth hackers should focus on in order to achieve sustainable growth and how to create an experimental funnel, as well as various practical tips and tricks (with example from other successful organisations). Click here to download this growth hacking guide. Matthew Barby, advisor to a number of startups and large SaaS businesses, is also a well-known investor, lecturer, and global speaker. In this guide, you will have the chance to take a comprehensive look at a range of different growth hacking tactics that he has tried and tested to scale growth within startups that he has previously worked with. He takes you through some of the core fundamentals of promoting a SaaS startup and outlines some of the specific techniques that you can use to promote your own startup. Brad Batesole, marketing expert who develops trainings for business networking service LinkedIn, has taken a close look on how to identify and leverage opportunities in the market to grow your business. He discusses high-level concepts necessary to adopt the mindset of a growth hacker and understand the methodology behind it. He has provided an understanding of why growth hacking works, when it doesn’t work, and what steps to take before you get started. This guide will take you beyond the concepts, and take a look at companies who have successfully implemented growth hacking in their marketing efforts. Click here to view this course. 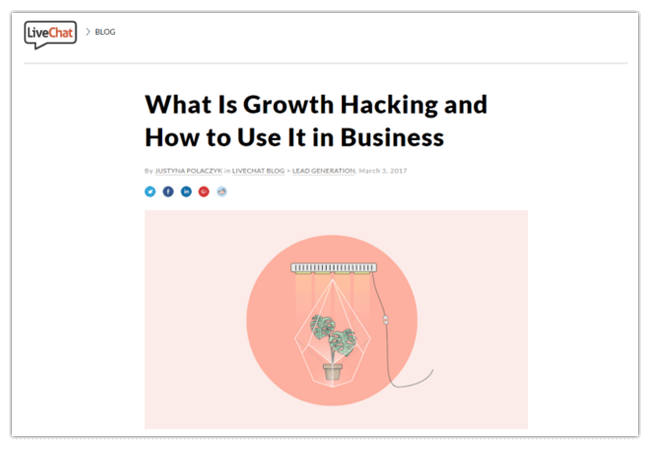 If you feel just a little curious and you’re asking yourself what exactly does Growth Hacking entail, then this blog on Growth Hacking might be what you’re looking for. This guide starts off by describing (in detail) what this new concept really is. 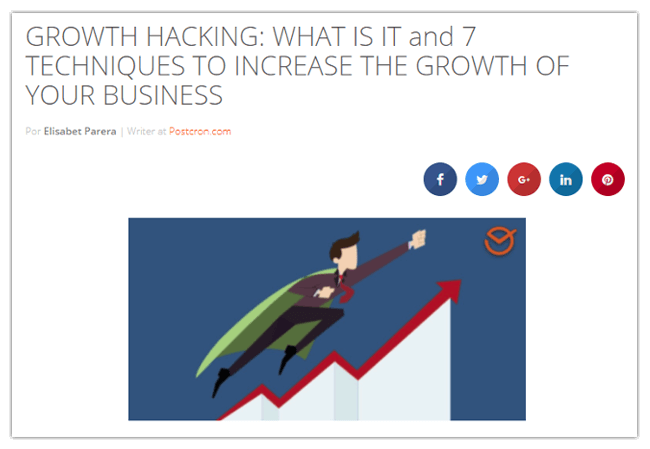 It also lists 7 strategies that a good Business Growth Hacker should incorporate to increase the business’ growth– as well as how you can apply them. There are a lot of possible ways to measure the success of a business, but Michal Fiech, the leader of LiveChat growth hacking team suggests focusing on so called “pirate metrics” or “AARRR” metrics (Acquisition, Activation, Retention, Referrals and Revenue) which are outlined and discussed in this guide. Author of the article, Justyna Polaczyk, also touches on other aspects such as the differences between Growth Hacking and Traditional Marketing. 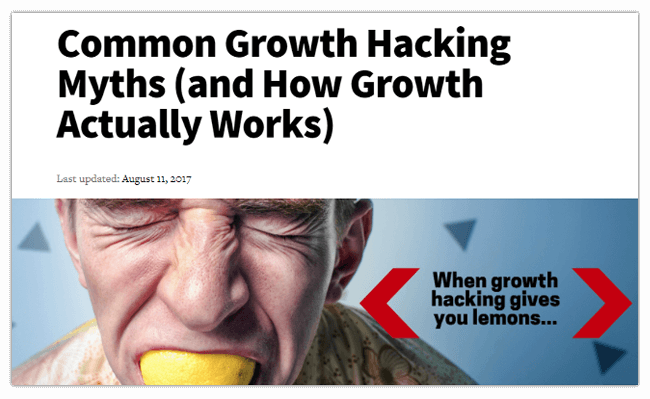 A deep dive into growth hacking, this guide by CXL focuses on topics such as The Evolution of Growth Hacking, How Is Growth Hacking Defined Today, What Is the Overlap Between Growth Hacking and CRO And Growth Hacking Mistakes & Myths. What makes the article interesting is that it has quoted definitions and details from famous growth hacking experts like Andrew Chen, Ryan Holiday and David Arnoux. The secret behind effective growth hacking is to follow a proven framework, and implement the right strategy at the right time. Ehsan Jahandarpour, a growth hacking influencer and start-up coach outlines a set of super easy-to-implement growth hacking techniques that you can include in your marketing strategy – attract, engage, acquire and maintain. Click here to view this article. Looking for some more insights from the one-and-only, Neil Patel? Stay tuned. Growth hacking isn’t about tactics and techniques. You can’t do what Airbnb did and achieve the same result that Airbnb achieved. A simple mental shift can produce an enormous business advantage. The reasons why growth hacking is changing almost everything are varied and vast. 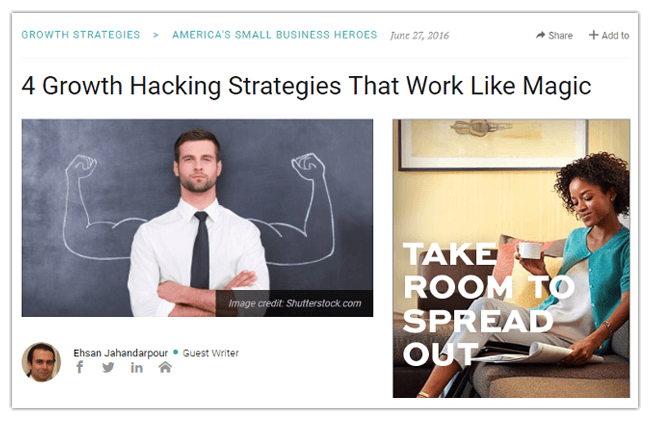 This article tells you how growth hacking may be able to revolutionize your own business. Kevin Ho, Content Marketer at Wishpond, who is also a part of a startup that’s grown to over 250k unique pageviews a month, and over 300k signups to date has compiled what he has learned in this guide: 100 growth hacks free of charge to take back to your team and leverage his findings. Click here to read about his 100 hacks. Did you find this round-up useful? We hope you enjoyed our list of growth hacker resources – if you did – we’d be really happy if you shared it. Also, feel free to let us know (in the comments section) if there are any other nice guides that we’re missing! Looking for some tools in particular that might help you get started ‘hacking your growth’? Be sure to check out 35 Best Growth Hacking Tools for Startups.